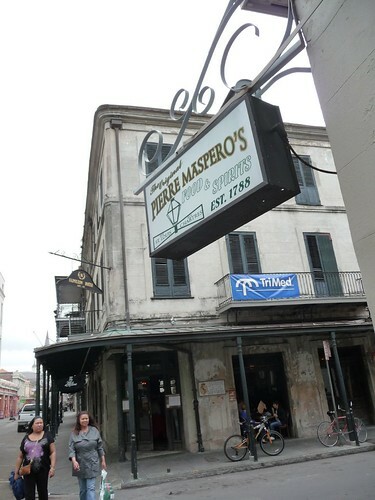 Mali Mish – Day 35: Last day in New Orleans. According to the meteorologists we watched on New Orleans news last night, today has an 80% chance of thunderstorms. That might be a problem because it is our last day in New Orleans and we have things to do and places to see. Being the troopers that we are, we grabbed our umbrellas and headed out into the French Quarters one last time. We drove the 10 miles into town today and found a nice place to eat some breakfast before we started our day. Most of the restaurants don’t open until 11am since they don’t serve breakfast. The place we ate at happens to have a great breakfast menu and we stuffed our faces with jambalaya and pulled pork omelets while Ava had a short stack of pancakes with real maple syrup that tasted like it was made out of beignets. Yum. 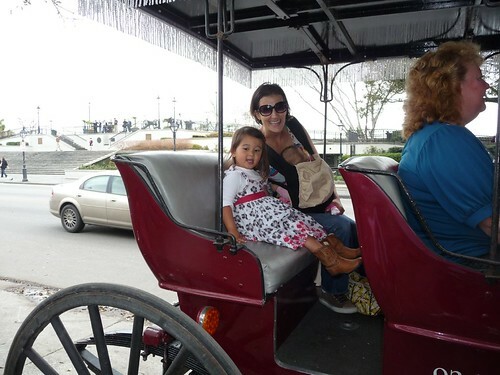 We headed over to Jackson Square because we were determined to take Ava on a horse carriage tour. 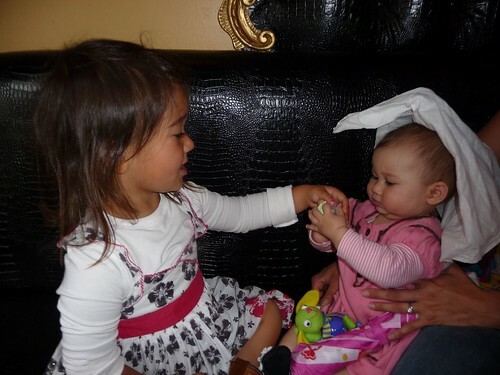 She is less interested in the tour than she is in riding in a carriage like one of her favorite princesses Cinderella. Right in front of Jackson Square is where the carriages line up and takes people on hour-long tours that is actually very informative and educational on the history of the city. 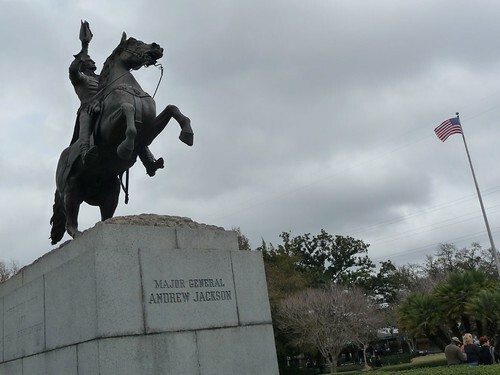 Jackson Square is named after Andrew Jackson, the 7th president of the United States. Before he was the president, he was the governor of Florida and the commander of the battle of New Orleans. The Battle of New Orleans was the final battle fought of the War of 1812 between the United States and Britain.The British troops had intended on invading Louisiana which the United States had acquired from France with the Louisiana Purchase a few years ago. The battle actually took place after a peace treaty had already been signed but as they didn’t have Facebook or Twitter back in those days, they did not get the news until months later. The tour we went on was a hour long and took us through pretty much all of the French Quarter and also the Catholic cemetery. One of the most famous voodoo women in the history of New Orleans is a woman named Marie Laveau. 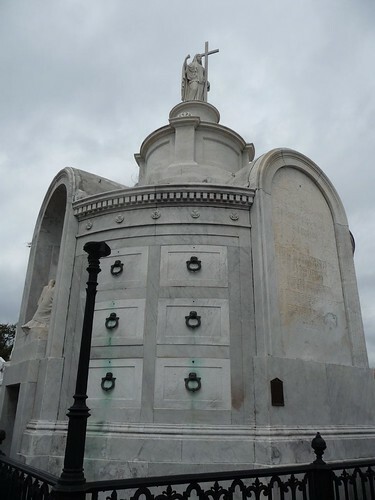 She is rumored to have been buried in one of the the tombs in the cemetery that the Catholic church owns near the French Quarter. 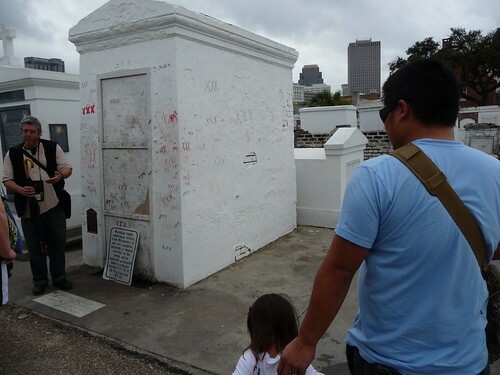 Legend has it that if you visit her tomb and draw three Xs on it and make a wish, through the power of her voodoo, it will come true. If you wish indeed comes true, you are then obligated to come back to her tomb and leave a gift. People usually bring things like flowers, bottles of rum or even cash. It had gotten so out of hand and the city has since banned the practice. Since this cemetery is owned by the Catholic church, only Catholics are allowed to be buried here. 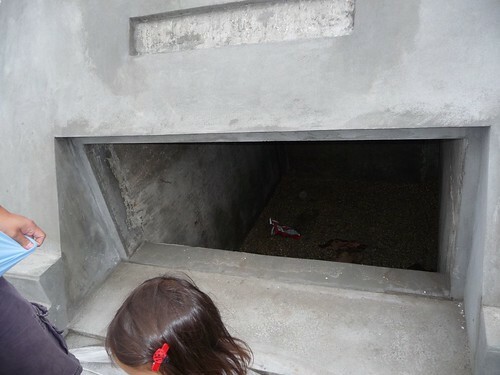 Even so, you can only be buried here if you already belong to a family or a society that has an existing tomb. This one here is owned by the Italian society and has something like 3,500 bodies buried in it over many many years. The only way for someone to get a new tomb built here these days, is to donate a ‘sizable’ amount to the Catholic church. Which is what actor Nicolas Cage apparently has done. 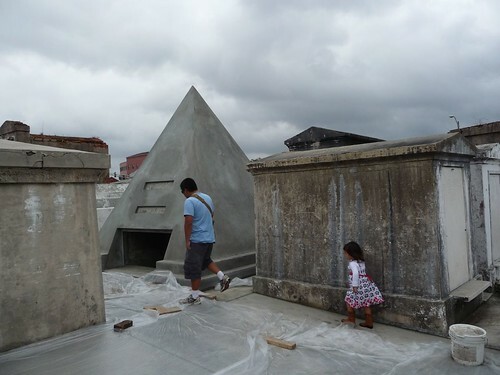 He is in the process of building a pyramid-shaped tomb here as his eternal resting place. I guess he was really pleased with his performance in National Treasure that he thought it would symbolize him in the afterlife. Unfortunately someone else did not thing much of his pyramid. There was an empty bag of Doritos someone had left him as a souvenir. 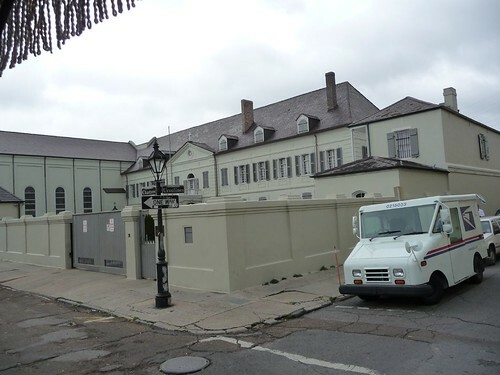 Nicolas Cage at one point owned a couple of the biggest mansions in the French Quarter. Through some shady accounting and probably poor records keeping, he racked up a bill with the IRS of over 7 million bucks. They eventually seized the 2 mansions from him and sold them at auction to cover his back taxes. One of the mansions is said to be the most haunted building in town. 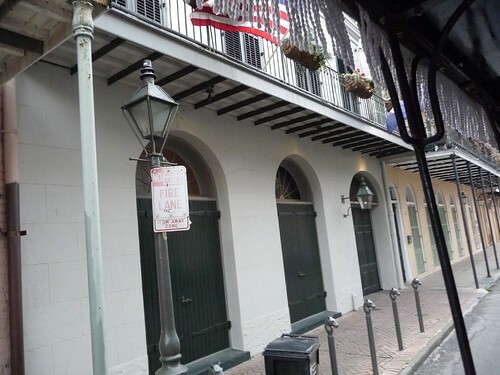 The originally owner had tortured many of her slaves in the top floor and their spirits have lingered ever since. 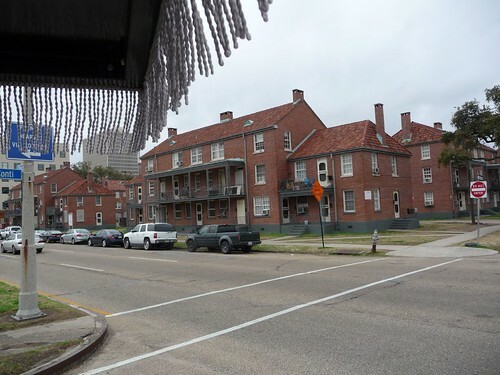 Near the cemetery, is the area called Storyville close to where Jazz legend Louis Armstrong was born and raised. It was the red-light district of his days. During the first World War, the government shut down its brothel operations because many of the navy servicemen were going AWAL amongst a number of other reasons. 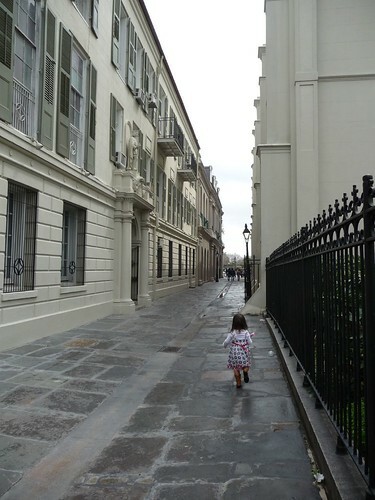 Most of the buildings in the French Quarter are of Spanish Colonial design and made of bricks. Even though many of the original buildings were wooden and of French origin, much of it burned down during some of the major fires in the late 1700’s. This building here is the only surviving building from the French era. During the ghost tours, it is said that the third floor of the building is where the vampires live. That is if you believe in that kind of thing. As we wound down towards the end of the tour, we drove by this house. 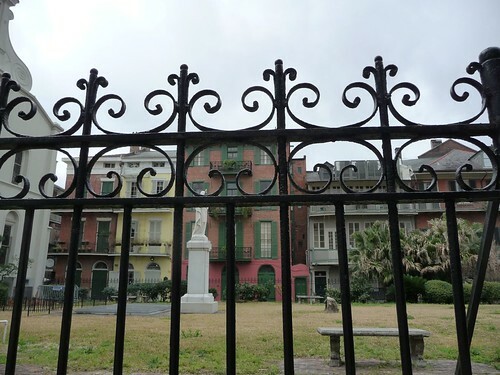 Most of the houses in the French Quarter consists of the main house, the courtyard in the back and the original slave quarters behind it. Back in the day, the streets were often so filthy that houses looked into its own courtyards rather than to the street. if you paid attention to the houses in town, most of them have carriage ways that look right into beautifully decorated courtyards right inside of them. This one is no different. The only difference is that this is now owned by the celebrity couple Brad Pitt and Angelina Jolie along with the 10,000 children. OK, maybe it’s only 7 but who’s counting. They were not in town during this time because there were no bodyguards in the front of the building which is the telltale sign of their presence. Another interesting thing about the horse carriage tour is that New Orleans has outlawed the use of horses on these tours. The summer seasons are too hot and too inhumane for horses to endure the labor so now all of the tours are done by mules who are better suited for the job. 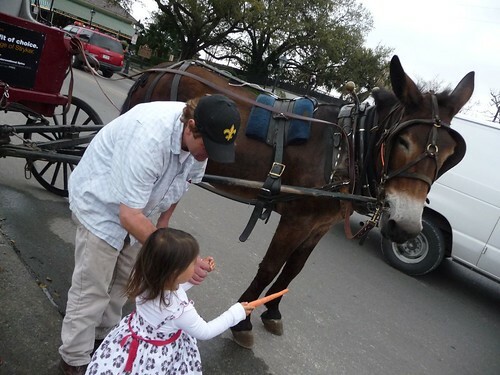 Here is our tour guide showing Ava how to give the mule his favorite food, the carrot. Meanwhile, I was on my way to get my favorite food from New Orleans, The Shrimp Po Boy. 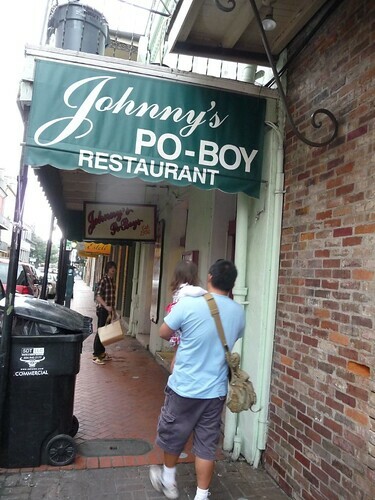 And Johnny’s makes the best po boys in town. Marlene could not be out done by me and proceeded to hunt down another delicacy of her own. The mint julep. She had been wanting one ever since the beginning of our visit and it was the last item to check off of our list before heading out of here tomorrow. On the way back to our campsite, we stopped to check out a place our friends Claire and Daniel had told us about. 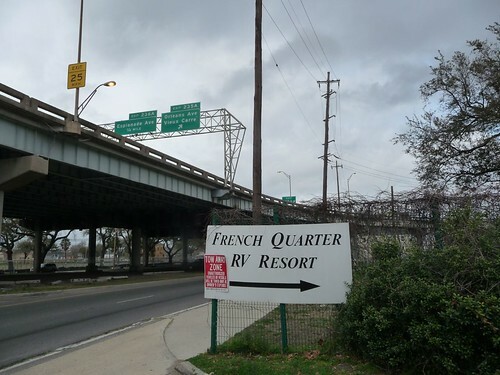 It was an RV Resort within walking distance to the French Quarter called the French Quarter RV Resort. I know, they really took a chance there with the name. It is nice but pretty much what you would expect. 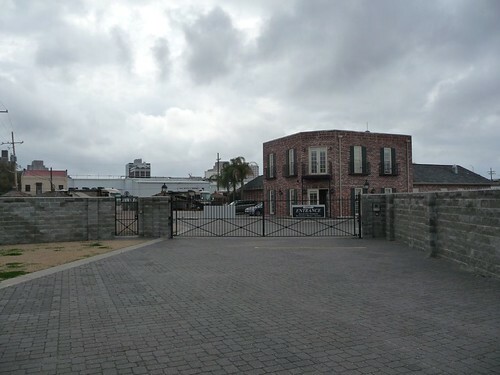 A fenced-in parking lot with RVs inches away from each other. Even though it does have some nice amenities like a spa and a club house, we just could no justify the $70 a night or $400 a week we would have spent to stay there. It just doesn’t make sense since we will not be taking advantage of the night life in town and we actually enjoy being away from the action to relax and soak in the nice weather this time of year. 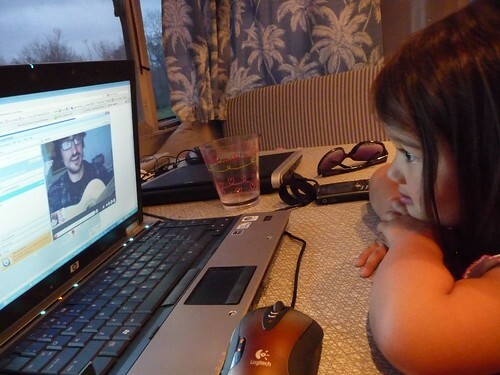 When we got back to the campsite, Ava got a call from her Uncle Deets (Marlene’s brother David) who played her favorite song via Skype that she learned last year during her swimming class at the YMCA: The More We Get Together. Tomorrow, we pack up and head across 3 states to Florida. 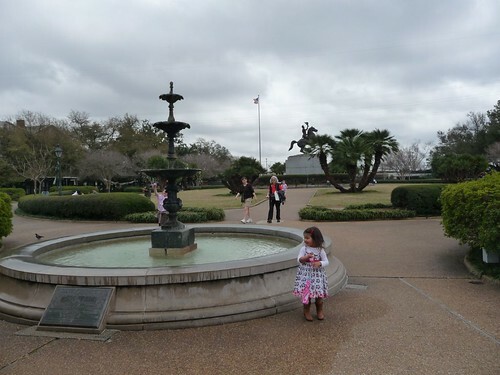 Photo Slide Show: Road Trip 2010 – World War II Museum in New Orleans. 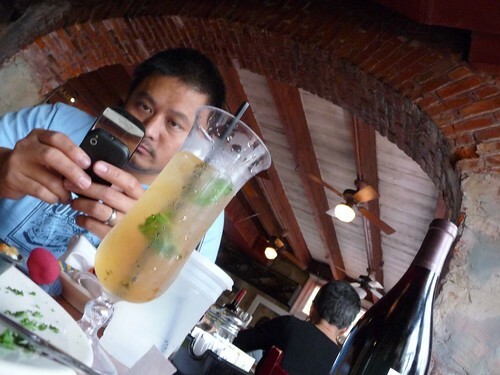 2 Responses to Day 35: Last day in New Orleans. Look at you all go! There’s no slowing you down! 🙂 Glad to see that you enjoyed Louisiana.